New Delhi: SABIC, a global leade r in diversified chemicals, reached a milestone of touching the lives of over 1,00,000 government/government aided school children in Delhi, Gurgaon, Bengaluru, Vadodara, Chennai and Mumbai through its “They See, They Learn” eye care initiative and targets to reach 2,00,000 children by December 2017. As part of SABIC’s ongoing corporate social responsibility commitment, the eye care initiative focuses on education by vision testing and providing spectacles free of cost to children found with correctible vision. Among the 1,00,000 school children whose vision testing was done, 11 percent required spectacles. An additional 3 percent required further testing for other eye ailments and were referred to district hospital. 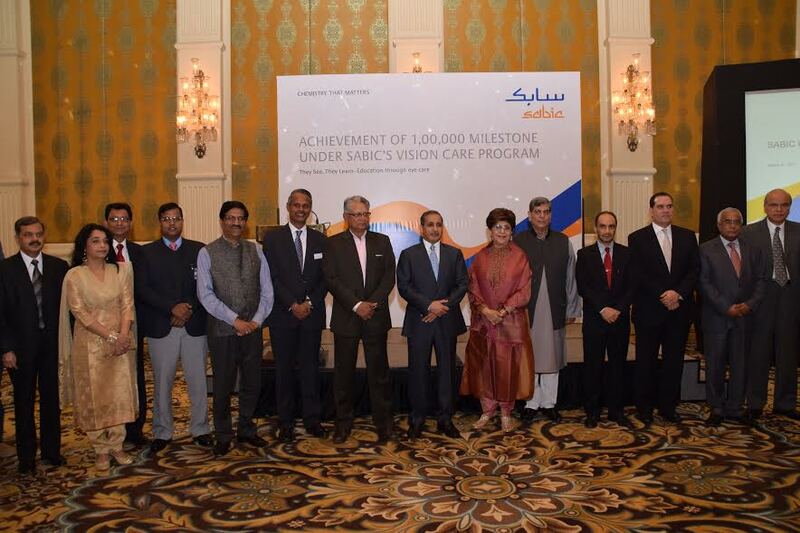 A celebratory luncheon was organised by SABIC to mark the occasion in the presence of His Excellency, Dr. Saud bin Mohammed Al-Sati, Ambassador, Kingdom Of Saudi Arabia to India at The Leela Palace Hotel in New Delhi. Mr. Amar Sinha, Secretary (Economic Relations), Ministry of External Affairs, Government of India was the Chief Guest of the event. SABIC embarked upon the Eyecare initiative “They See, They Learn” in 2014 and till date, has successfully increased its total reach to over 1,00,000 children across six cities in India where it operates – Delhi, Gurgaon, Bengaluru, Vadodara, Chennai and Mumbai. This initiative aims to facilitate equal opportunities at further education for children with correctible vision. The project cycle involves vision testing in the school and providing spectacles free of cost as per prescription to the children. Where required the child is also referred to a specialist and helped in getting proper treatment from the hospital. With employee engagement at the core of SABIC’s corporate social responsibility, 300 SABIC employee volunteers across India spent over 10000 hours volunteering for the “They See, They Learn” initiative in last two years, working closely with the program partners and supporting with on-ground logistics.